Introducing Kiona Smith-Strickland, our shiny new contributor. A simple telegram plunged America into the Great War. The Zimmermann telegram, intercepted by American intelligence in April 1917, revealed Germany’s efforts to encourage Mexico to invade the United States. For a towheaded kid from Arizona named Frank Luke, Jr., and other citizens of the states along the Mexican border, the threat of invasion was real and personal. Anti-German sentiment swept the nation that spring. Sauerkraut became “Victory Cabbage”, the precursor to Freedom Fries, and suspicion fell on families of German descent such as the Lukes, whose name had been Luecke just a generation before. The immigrants’ son Frank Luke, Jr. had a lot to prove when he joined the Army a few months later. 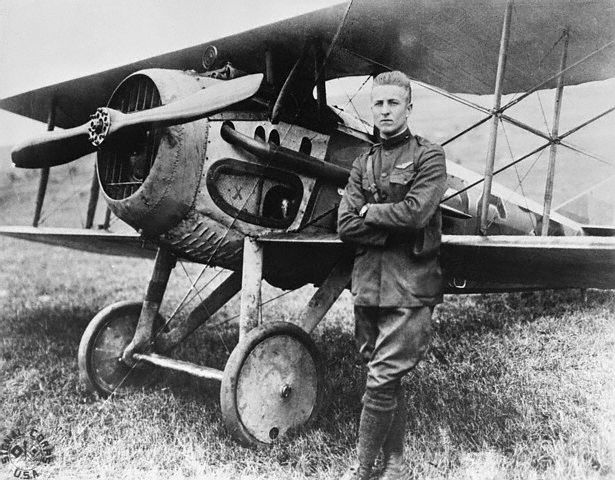 By the time Luke completed flight training, received his commission, and joined the 27th Aero Squadron in France in July 1918, the surge of American forces onto the Western Front promised a swift end to the war – and the life expectancy of a pursuit pilot at the front was just three weeks. If Frank Luke was going to prove anything, he needed to work fast. In just a few months, he would demonstrate how well he could work under pressure, becoming one of the most decorated flyers of the First World War. Friends and family in Phoenix, Arizona, remember Frank Luke, Jr. as a fast-talking, confident, impulsive young man. The Army experienced this side of Frank early on; swamped with volunteers, they did not immediately respond to his enlistment application, so Frank wrote to the Adjutant’s Office to pester them for a report date. He received his reply and reported for duty on 29 September 1917. In those early days of aviation, pilots took to the air in boxes of thin wood and lacquered canvas. Seated behind an engine belching smoke and splattering oil, pilots flew with a gas tank wedged under one arm, hand-pumping fuel as they kept a wary eye on their gauges. Even a small vibration could cause the fragile aircraft to shake itself apart in midair. The new Spad XIII pursuit planes were so unreliable that they posed a serious hazard to their pilots’ lives even outside of combat. During flight training, Luke defined himself as a skilled and daring flier. Luke’s boisterous confidence followed him to his post in France, and his exuberant boasting of “I’ll get them Germans” quickly annoyed the seasoned pilots at Rembercort. They were even more irritated by his tendency to wander off from formation to hunt German aircraft, blaming engine trouble for his disappearance. He was an unreliable loner in the eyes of the other pilots, and his disappearances looked more like cowardice. On 16 August 1918, Lt. Luke finally met the enemy when four German Fokkers cut through his squadron’s formation. Luke reported that he dove down on the last Fokker in the flight, shooting it right off the tail of his squadron commander, Major Harold Hartney. Major Hartney, who had seen the enemy aircraft behind him one moment and gone the next, accepted Luke’s story, but few others saw it or believed it. Frank Luke Jr. was branded a liar. The start of the San Mihiel offensive on 12 September 1918 gave Luke his chance to prove his detractors wrong. To cover the advance on the ground, Lt. Luke’s squadron had been ordered to target and destroy German observation balloons. Observation balloons were rubberized silk bags filled with hydrogen, tethered to trucks or horse-drawn carts. A gondola suspended below the balloon held an observer equipped with a camera or a pair of field glasses. American pilots hunted them with incendiary bullets to ignite the flammable hydrogen gas. Spad XIIIs had to be outfitted with specialized machine guns to fire the rounds. The Germans called the balloons Drachen, or Dragons, for their flammability and the roaring sound of their inflation; the Americans called them Sausages for their elongated shape. Whatever their name, these elevated observation posts had to be destroyed for the American advance to proceed. From aloft, balloon observers could see down into the American trenches, where troop movements were usually hidden from ground-level view. Observers could use this vantage to direct devastating artillery fire. Drachen were among the toughest targets on the battlefield, even for the most skilled pursuit pilots. Located well behind enemy lines, they forced pilots to fly through patrolling Fokkers and over anti-aircraft emplacements just to get a shot at them. German fighter planes guarded the skies around the Drachen, and ground defenses included a battery of four to six anti-aircraft guns, accurate and deadly up to 14,000 feet. Low-altitude approaches faced Maschinengewehr 08 machine gun emplacements and a platoon of infantry, whose rifles could be lethal against wood-and-canvas planes. Storms battered the Western Front on 12 September. Lt. Luke spotted a Drache balloon hovering near the village of Marienville and dove on it from high above, swooping within yards of the top of the balloon, his left machine gun sputtering out incendiary rounds. After three close passes through a storm of German lead and shrapnel, the wet rubberized silk finally ignited, and a brilliant orange fireball marked Frank Luke’s first irrefutable kill. Two days later, on a morning patrol with two other pilots, Luke attacked a Drache near Boinville and watched as it deflated and sank to smother its nest, too wet from the morning’s drizzle to ignite. That afternoon marked the start of Lt. Luke’s partnership with his bunkmate and friend Lt. Joe Wehner, a mission that would establish the pattern for their flights together. Near the town of Buzy, Luke plunged down on a Drache while Lt. Wehner provided cover and lookout from above. The balloon went up in flames on the first pass, just as eight Fokkers swarmed the two American fighters. With both machine guns jammed, Luke could only retreat for the American lines while Wehner scattered the enemy. Launching a typical German observation balloon. The next night, Lieutenants Luke and Wehner took off at dusk. Flying over enemy lines in the gathering darkness was dangerous and unprecedented, but it guaranteed a chance of catching the Drachen crews off-guard. Luke and Wehner hoped that the distorting twilight would make aiming anti-aircraft guns harder and Fokker patrols less likely. The tactic was effective; three burning Drachen lit the French sky that night. General Billy Mitchell himself arrived at Rembercort the following evening to witness the twilight Drachen hunt. The two pilots dove together on the first balloon and then separated as they pulled away to avoid the fireball. Lt. Luke killed a second Drache nearby, and Lt. Wehner destroyed a third in the opposite direction. The two landed at Rembercort just minutes apart, greeted by an awestruck General Mitchell. The end of the San Mihiel offensive bought the First Pursuit Group only a brief respite. On 18 September Luke and Wehner were in the air again. Using their familiar tactics, the team destroyed two Drachen near the village of Labeuville, but attracted the attention of an entire squadron of Fokkers, Jasta 15. Most of the German squadron went after Wehner, an obvious target at higher altitude. Frank Luke could do nothing to help his wingman. Two of the enemy fighters swooped in behind Frank, forcing him to focus on the immediate problem of survival. He turned and charged straight at them, machine gun bursts sending them both plummeting to the ground. When the dust settled, he searched the skies for Joe, but saw only the circling remainder of Jasta 15. Accustomed to being separated from his wingman in the chaos of combat, Lt. Luke turned for home. Lt. Wehner would not meet his wingman back at Rembercort. A bullet from the guns of German Lt. George von Hantelmann had blown through the base of Joe Wehner’s skull and out the other side, taking his jaw with it. By the time his Spad slammed into the ground, the young pilot was already dead. His body was recovered after the war. On his way back to the lines, Lt. Luke happened across two French fighters in pursuit of a German Halberstadt observation plane. Luke swooped in for his fifth kill that day. The mangled wreckage of the Halberstadt in a field near Rattentaut marked the moment when Luke passed Eddie Rickenbacker for the title of top American ace. This moment made Frank Luke, Jr. a sensation in the Allied press, which was hungry for war heroes. The news coverage was a surprise to the Luke family in Phoenix and Frank’s young fiancee in California. For months his letters had led them to believe that he was still behind the lines, awaiting his chance at combat flying. He said that he did not want them to worry. There was little chance of that now. Luke alongside his 13th official kill. When word of Lt. Wehner’s death reached the squadron, the loss of his trusted wingman and friend rattled the usually exuberant Lt. Luke despite his success. Major Hartney, now commander of the First Pursuit Group, sent the new Ace of Aces on a seven-day pass to Paris. Luke returned after only four days, citing “nothing to do.” Frank Luke was ready to be back in the air. The day after his return to duty, he flew with a new wingman, Lt. Ivan Roberts. While Drachen-hunting over the Meuse, Luke and Roberts encountered a flight of five Fokkers. Luke destroyed one; distracted by combat, he did not see Lt. Roberts’s plane go down. Ivan Roberts’s body was never recovered. Two days later, frustrated by inactivity, Lt. Luke took off at dawn without orders on an unplanned mission against a Drachen at Bantheville. He celebrated his kill by landing at a nearby French airfield for the night. Returning to Rembercort the next day, he reported to his squadron commander, Lt. Alfred Grant, who angrily grounded Luke until dusk. Another twilight Drachen-hunting mission was in the works, and Frank Luke was slated to fly it, if he could wait long enough. Turning toward the Meuse River and the German lines, the men of the balloon company watched as Luke’s plane dove toward the Drachen hovering near Liny. A fireball blossomed on the horizon, followed a few minutes later by the fireball of Luke’s second kill near Milly. Luke then turned his Spad toward the village of Murvaux. The Murvaux Drachen went down in flames, but instead of banking away to seek another target, Lt. Luke brought his Spad in for a rough landing on the outskirts of Murvaux, near Milly Creek. He had taken heavy fire from the Drachen’s ground defenses, and even Frank Luke could not fly far with a bullet lodged in his chest. A man-carrying kite carrying a man. Despite search efforts by his flight leader, Lt. Luke was listed as missing in action until after the war. His remains lay in a shallow grave in the churchyard in Murvaux, beneath a wooden cross naming him only “Unknown American Aviator.” After the Armistice, searchers identified his body by the serial number of the watch he still wore and by the tale witnesses told of his final moments. Today, Lt. Frank Luke, Jr. rests in an American military cemetery near the Meuse River. Word of Luke’s promotion to First Lieutenant reached his squadron two days after his disappearance. Other accolades also arrived posthumously. Before Luke’s final mission, Lt. Grant had recommended him for a Distinguished Service Cross for his actions during the San Mihiel offensive. It was awarded shortly after his remains were identified. Following the war, Lt. Luke’s commanding officer recommended him for the Congressional Medal of Honor for his exploits earlier in September. Frank Luke became the first Army pilot to receive the honor. The perilous efforts of Lt. Luke and his fellow pilots prompted the Germans to rely more heavily on man-lifting kites for battlefield surveillance. On a breezy day a long train of air-catching apparatuses anchored to the Earth could dangle a “pilot” from a harness hundreds of feet in the sky. These presented smaller targets that could be more quickly winched to safety on the ground, but they were tricky to control and even more vulnerable to wind than the cumbersome Drachen. After World War I, balloons and kites drifted into aviation history as advances in design made airplanes a viable reconnaissance tool in their own right. Written by Kiona Smith-Strickland, copyright © 06 December 2012. Kiona is a freelance journalist and author based in northeastern Kansas. Her articles on science and technology topics have appeared in the online edition of Popular Mechanics, and she is a contributing editor at NFC Times. She also writes science fiction, fantasy, and horror stories and is currently revising her first novel. Podcast sound design by Alan Bellows. Podcast narration by Simon Whistler. Edited by Alan Bellows. Last updated 22 March 2016. Great Story. I hadn’t heard of the sausage balloons before. Very well written. These men had to have balls of steel to climb into a plane so soon after their introduction as weapons of war. That’s for sure. The pursuit aircraft of the day were nearly as dangerous as the enemy. A couple of Lt. Luke’s colleagues didn’t survive training, and that wasn’t uncommon; the training field actually had a cemetery nearby. As a side note, here’s a quick blog post with some followup commentary: http://justfins.blogspot.com/2012/12/the-arizona-dragonslayer.html. The middle part of that sentence is incorrect. It was intercepted by British Intelligence (not American) January (not April) 16th, 1917. It was then decoded and eventually passed to US ambassador Walter Hines Page on February 20th, who then passed it to Woodrow Wilson a few days later after verifying it. The US entered the “Great War” on April 6th, 1917. Wikipedia also lists Luke as enlisting on the 25th of September, not the 29th, though that may be down to the time between being “enlisted” and “reporting for duty”. The 29th seems like poetic license though, considering that that’s his death date as well. Finally, you might want to mention that the American military cemetery that he is buried in is located in France, since most people don’t know where the Meuse River is. Anyways, not really trying to nit-pick, but the bit about the Zimmermann telegram jumped out at me, so I checked a few other details too. Thanks for the article, always nice to see more Damn Interesting stuff! P.S. In the “Further Reading” there is an extra slash near the end of the National Museum of the U.S. Air Force link that breaks that link. It should end with “factsheet.asp?id=711” (no slash after the “?”). Luke Air Force Base, Arizona, is named after this remarkable man. Good on ya, sir. Very interesting indeed! Really enjoyed reading your article and hope you will do more. I always am happy to see in my email that there is a new Damn Interesting article to read. Really look forward to them. Thanks very much. possibly do better I hope. World War one espionage might make for a great damninteresting article! I’d be interested to know how/if his German ancestry affected his reception in those newspapers. Did he prove himself sufficiently? How did his career affect the attitude toward other German Americans? I can’t back it up with any sources or anything, but I heard somewhere that the Zimmerman note was fake, created by the Allies (presumably the British, since they were the ones who “discovered” it) to push America into the war. At any rate though, this article was, indeed, damn interesting. The isolationist movement often claimed during the interbellum that the Zimmerman telegram had been a lie. The telegram was embarrasing for their cause as it proved that while the USA didn’t want to get involved, it couldn’t afford to ignore world politics without failing to protect American interests. The German minister, Mr. Zimmerman, actually admitted directly after it was published, that he had sent the telegram. And there really was no reason why he shouldn’t, as it contained nothing that was either treacherous or with bad intentions. The telegram clearly stated that Germany did not want the USA to get involved in the war and would make every effort it could afford to keep them neutral. Only in the event that war proved to be unavoidable, was the German ambassador to seek an alliance with Mexico. The telegram clearly states that no such proposition was to be made before war had actually been declared between the USA and Germany. The telegram was therefore merely a precaution. There is nothing wrong with a nation seeking allies in time of war. and to beseech them to attack a common enemy. The reason why the telegram caused such an uproar was that it was presented in the press as a stab in the American back by the Germans. The real problem the United States government had with the telegram was that it announced the resumption of unrestricted submarine warfare, which had been suspended by Germany due to huge diplomatic pressure by the USA after the sinking of the Lusitania. Meanwhile American merchant vessels were actively suplying Britain and France, not just with food but with weapons, munition and other military supplies also. The one thing Germany could no longer afford was to let it’s most powerful weapon, the U-boats, remain impotent while it’s own economy was smothered by the blockade by the British surface fleet. The German economy was simply not capable of keeping up the war effort for more than another year and the only way to force Britain to negotiate peace within that time period was by strangling their island with U-boats. If that meant war with the USA, so be it.. The Germans hoped they would be able to force peace with Britain and France, as they had with Russia, before the USA could bring it’s troops to bear. Without a European base their threat would be much lessened and their resolve lowered. As a sidenote: It may very well be that the publication of the telegram in the American press and it’s mispresentation therein was a carefully managed propaganda affair to get the American public war-ready after the United states government had decided it could not, and would not, accept the resumption of unrestricted submarine warfare. But the telegram itself was authentic. Super article, and of course yummy brain food to delight! Pfft! Never mind all that back snitchin hoo-har about previous articles not being up to par. If they think they can do better, then please let them submit themselves! Well done DI, and well done Kiona! Always loved DI, and this article was no exception. Wish you guys still got the attention you used to! I’d bet you’d find a few more aspiring authors! GDSquire, you would make a better impression if you did not merely say “That sucked!”. How about offering *constructive* criticism? If you want the site to be better, *help* it be better. Also, complaining about the frequency of issue only shows that you do not know (or, perhaps, do not care?) about the authors’ personal matters that can sometimes strongly affect their production. The content here is offered freely (without even support from advertising). Be grateful — or at least, not grouchy. Okay, everyone, let’s get this thread back on topic before I have to bring out the really big stick. GDSquire, we respect your viewpoint and appreciate you sharing it with us – it’s much more helpful to know what our readers think than to be kept in the dark. Silverhill and WXNerd, thanks for jumping to our defense. We appreciate that, too. Now, play nice. This really isn’t the place for an argument. Let’s stick to discussing the article, ok? I hate to be “that guy,” but it should be styled simply The Medal of Honor, not The “Congressional” Medal of Honor. Many veterans would be less courteous about this, it tends to get people riled up. Otherwise, I thought the article was pretty damn interesting.